Mysterious Reviews, mysteries reviewed by the Hidden Staircase Mystery Books, is publishing a new review of Heir of the Dog by Judi McCoy. For our blog readers, we are printing it first here in advance of its publication on our website. 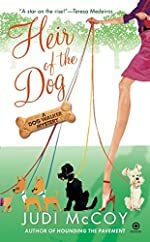 Review: Professional dogwalker Ellie Engleman and Rudy, her "yorkiepoo", a Yorkshire terrier/poodle, find murder in Central Park in Heir of the Dog, the second mystery in this series by Judi McCoy. One evening Ellie and Rudy run across the lifeless figure of Gary Veridon, a homeless park dweller that they had befriended and often stopped and talked with. Since she had found the body (actually Rudy did) and reported it to the police, Ellie naturally comes under suspicion. Ellie has a bit of history here, having been involved in a dognapping homicide a few months ago. She becomes even more apprehensive when a vendor hands her an envelope addressed to “Ellie and Rudy” that had been written by the deceased. Contained in the envelope were a will and a key. Gary’s will left his entire estate to Rudy, with Ellie as the executor. What? Did that mean that Rudy was the sole owner of the trash Gary collected and kept in his beaten down cardboard box shelter that he called his home? Rudy thought there had to be more to it than that. And he was right, there was. The key was to a safety deposit box at a local bank. Sam, the police detective she had worked with on the dognapping case, went with her to the bank. There they find that Gary at one time had an estate of over two million dollars. He had, however, given large sums to various charities, leaving a balance of over $650,000. He had written a note for Ellie telling her that if she had the box she should know that he had been killed by his older brother, Thompson, who had spent 30 years in prison for the murder of their parents. When Sam checked the police files he finds that thirty years ago Thompson Veridon did murder his parents while his young brother, Gary, watched. Gary became a witness for the prosecution and Thompson was found guilty and sentenced to thirty years in prison. Now Thompson has been released from prison and is surely in search of Gary. He wants to collect the inheritence which he believes belongs to him. Did Thompson find Gary in the bowels of Central Park? Was it Thompson who killed Gary? If so, who else will he kill in order to obtain what he believes is his? Heir of the Dog is an enjoyable, amusing mystery. Ellie is indeed in tune with Rudy; their conversations are comical and witty. But they aren't alone: the repartee between Ellie and Sam is also amusing. In fact, there is a lot of funny dialog between Ellie's friends, Sam, and the dogs she walks. But there's also a murder to be solved, and when Rudy is abducted and kept hidden by the killer for ransom, Ellie is ordered to deliver the inheritence for his safe return. Now it's personal: no amount of money can compare to the love shared with a canine buddy. In the end, Heir of the Dog is a charming and winning whodunit. Special thanks to guest reviewer Betty of The Betz Review for contributing her review of Heir of the Dog and to Penguin Group for providing a copy of the book for this review. If you are interested in purchasing Heir of the Dog from Amazon.com, please click the button to the right. Heir of the Dog (Kindle edition) is also available. Learn more about the Kindle, Amazon's Wireless Reading Device. Synopsis (from the publisher): Professional dog walker Ellie Engleman is more than just a pal to her pooches -- she can also read their minds. When Ellie and her terrier mix Rudy find the corpse of a troubled-but-harmless park-dweller in Central Park, the dog walker becomes a prime suspect for murder. When it turns out Rudy is the sole beneficiary of the victim's inheritance, Ellie, Rudy, and Detective Sam Ryder follow the trail of clues to a key to a safety deposit box that just might point to the motive and help them sniff out the real killer.